Given that we've been in moving limbo for months now, I've kind of got bored of our house now. It's cramped and messy and a little unloved in terms of us moving things around and updating things. But one of the things that I do like in the house are our little pockets of wall decorations we have up and I'm even more excited to get started on the walls in the new house. At lot of the pieces we currently have have were gifts, have sentimental value to us, are handmade or are photo's of wonderful memories for us, a lot like this wall in the dining room. I am a big fan of clusters of pictures, ours now sit in black but mismatching frames, many of the ones we've got up are Plastikote'd old frames from a time I was too poor to pop out and buy new frames so took to spray painting the pavement outside my shared house with black squares. For the new house we've already had some black and white mountain pictures printed from our recent snowboarding holidays for the monochrome hallway (the frames for these came from a random auction box my mum bought) and we'll be taking the artwork we have with us, but I really really want to mix it up and bring in some new pieces in the new place too. I'm not sure it'll feel like we've moved if the walls stay the same. Is that silly? Plus we have a crap load more walls to cover! 1. I thought this Manchester Best print might be perfect for Jim's man room, given that he's from Manchester and loves his music and beer and all! 2. What room wouldn't be made a little sweeter with a light up star? None that's how many! 3. This amazing Roxy Disco canvas by Sheffield artist Alan Pennington is so awesome. I love the details. 4. What home would be complete without cocktail artwork to match their drinks station (and yes, of course we'll have a drinks station!) 5. This E.E Cummings quote rings true with me and I love the blue and the mixed media-ness of it too. 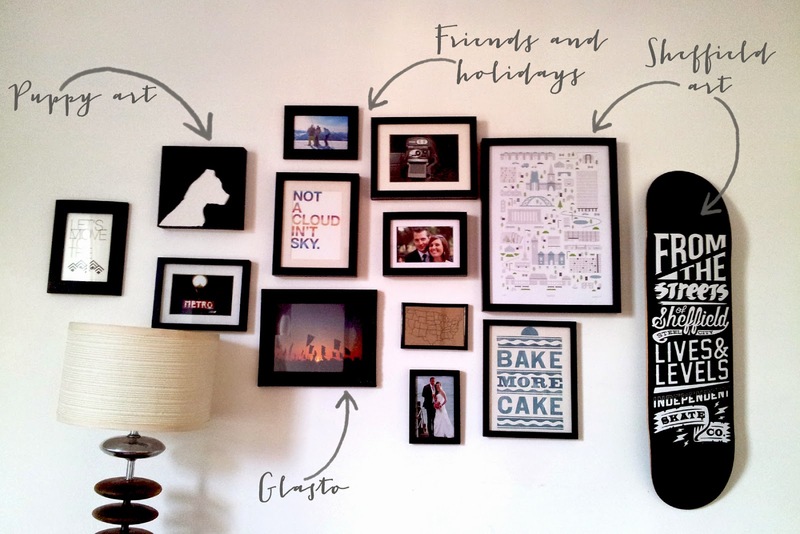 What is your favourite piece of wall art? And have you moved and gone wall covering crazy or kept things the same? 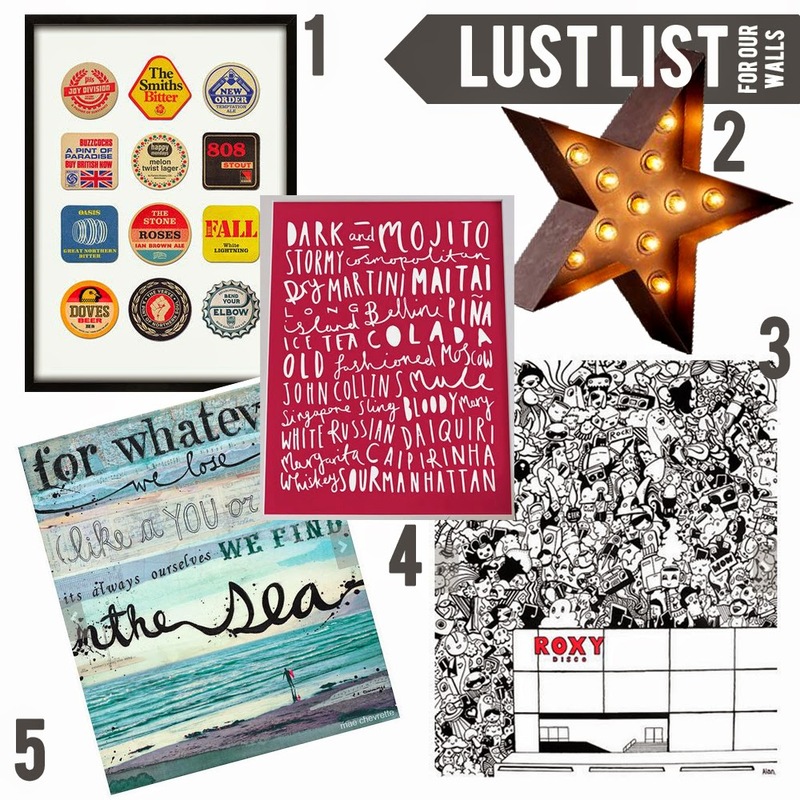 I do love some good wall art, all of your lust list are just fab. And erm, you have a drinks station?? I'll be round for cocktails at seven. The drinks station in this house is severely lacking, but in the new house it'll be awesome. Give us a few months and It'll hopefully be done! I frame everything in my house in matching black frames too, I like how it makes mismatched prints and pictures look cohesive. You've inspired me to rearrange some of mine into more of a cluster, I love how this looks. Thats what I love about it too. I thought about throwing some white ones in there too but it's not the same so I'm sticking with black. The new hallways ones need a good spray paint through as they are wooden! Glad to have been of some help Natalie. A good picture wall makes me happy every time! I don't really have any wall art, but I do have an embroidery hoop collection of various cross stitches i've done that I do like, although it's tiny pieces on a large wall in one big cluster so i'm probably going to have to rethink it a little when we move. It's a bit daunting trying to picture our wall stuff in another house, I can't quite imagine where they'll all move to just yet! That sounds awesome! I am sure once you are in the new place the perfect wall will come to mind, but maybe mix them up a bit so they aren't all up in the same way in the new place.